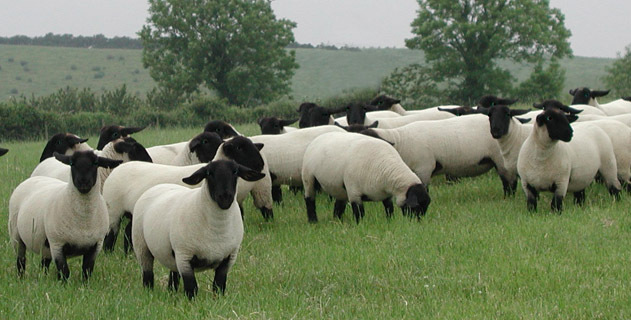 In celebration of Wool Week, why not take a moment to get to know some sheep? Over the past few days I've been viewing Know Your Wool - a free class on Craftsy. The class is taught by Deb Robson, one of the authors of the incredible Fleece & Fiber Sourcebook - so you can be sure she knows her stuff. Deb's beloved Suffolk sheep. Source. In the class, Deb gives a brief overview of different types of sheep, how they differ, and how to use them. The first few lessons of the class are great because they're entirely craft-agnostic -- whether you're a knitter, crocheter, spinner, weaver, or anything to do with yarn at all, they will be useful for you. Later lessons dealing with swatching and garments are more knitting-orientated, but the core concepts can still be extended to any fiber art. Even if you don't spin - especially if you don't spin - this class should be useful & interesting to you, since it focuses on breed-specific yarns, and even has a section on how to find them through fiber festivals, local yarn stores, and online.